Baby2 has really come into her own this sixth month. Her personality shines through in everything she does. Her face still looks very much like her brother’s but also more like other family members; she’s coming into her own unique “look.” She’s quickly becoming more and more independent (for a six-month-old; independence at this age does have its limits). As we have already seen in the proceeding months, Baby2 is such a happy girl. When she catches our eyes her whole face smiles with joy. When we have a dance party together she laughs and squeals with excitement. She bats her eyelashes and shields her gaze when you smile back. Her little cheeks puff up when she smiles and her dark blue eyes sparkle. Baby2 has grown so much! Now that I have had two children and they have similar growth patterns I can safely determine that Mr. Handsome and I simply do not have big babies. Baby2 is just now doubling her birth weight, for example. But our pediatrician certifies that she’s super healthy. We also saw a heart specialist last week (to proactively check out a supposed heart murmur that was not found by the specialist and is said to come and go in young children) and that doctor said she is “in picture-perfect health.” I feel incredibly fortunate to have such healthy children. She is mobile already. 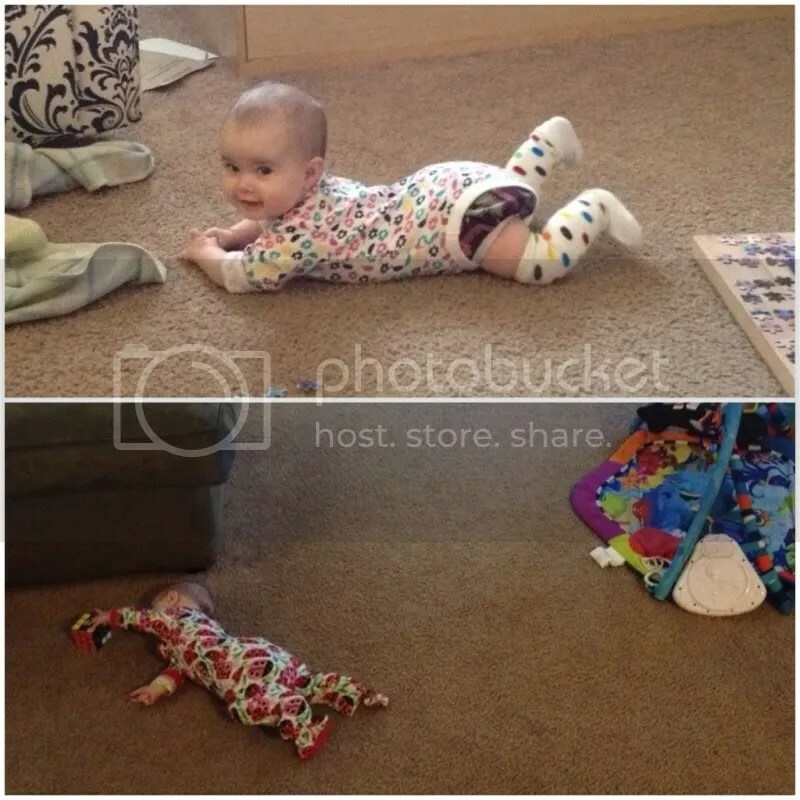 Last month she would roll from side-to-side but now she’s rolling clear across the floor. I put her down, turn around to grab something and she’s already like 10 feet away. Time to get the power strips and tiny Lego pieces off the floor I suppose. Oh baby-proofed house, how I’ve missed you (insert sarcastic face here). She will usually start on her back playing on her little “ocean” thing there but she’ll escape it and roll away in a flash! She wants to do things for herself. 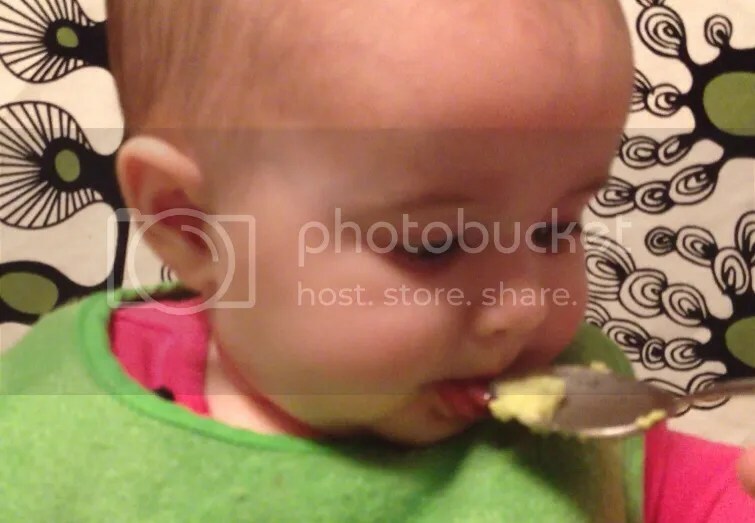 We have started giving her solid foods and she already wants to hold the spoon, mostly because she wants to grab at anything in front of her. We are giving her whole foods: we started with avacado, mashed with a spoon and mixed with a bit of breastmilk. She wasn’t too fond of the avacado and I can’t blame her – this recipe is no guacamole, folks. It’s pretty bland. Yes I tasted it. We are on bananas now. We just scrape a bit of banana on a spoon and serve it up. And then I eat the rest of the banana. Yum! She loves the banana. She probably eats twice as much of it in one sitting than the avacado. So like two-peas-size worth instead of one. She has a tummy the size of her fist and she’s already full of breastmilk when she’s fed a solid, so I’m not expecting much yet. Mr. Handsome says her poo is already more green though. This will be our cloth diaper test I believe. Stay tuned. As for me, I’m feeling pretty fantastic. I’m back down to my pre-pregnancy weight and I don’t feel the “squishness” in my midsection that I had felt even just last month (just feeling my normal squishiness now). I recall that after Kiddo1 was born it took a good six months before I felt “normal” again. Seems like six months is my adjustment period, which is just fine with me. If only I could have taken a six-month maternity leave, eh? However normal I feel, though, I still have my linea negra and I still have not had a period (and I’m pretty sure I’m not pregnant) so I’m just patiently – very, very patiently – waiting for the last piece of “normal” to fall into place. Wouldn’t it be wonderful if it just never came back?! Speaking of patience, Kiddo1 is getting better at connecting with his sister. He started actually acknowledging her at Christmas. Now he will sit at the table with her in the morning, eating his breakfast and not complain too much that she is staring at him (she loves to look at him!). He even picked up her toys when she dropped them to the floor the other day. We call this the “drop-pick-it-up game” in which the baby drops a toy over and over while someone picks it up for her every time. Kiddo1 invented this game so to see him play with his sister is pretty sweet. He was reluctant to play but he did it! They’re taking baby steps toward playing together. I can’t wait to see what the next six months bring! 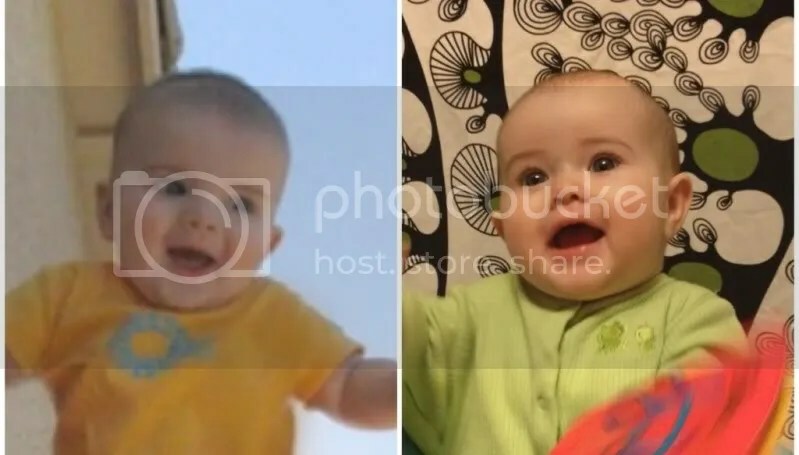 Posted in Body Care, Child Development, School-age Kid and tagged baby milestones, baby-led weaning, breast milk, nutrition, siblings, starting solids. Bookmark the permalink.